Before I share my One Monthly Goal for February, let me share with you what arrived yesterday. 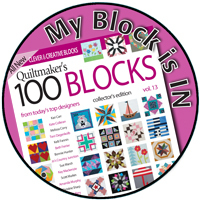 I am so excited I won January's One Monthly Goal and inaugural link party drawing hosted by Heidi @ Red Letter Quilts when I linked up a baby quilt, Sundae Plus, which I barely finished! 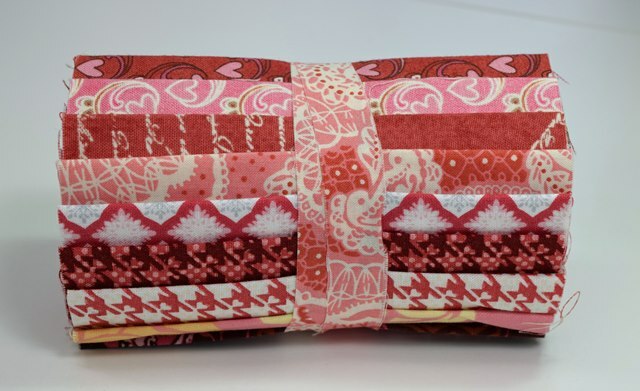 Heidi generously sent me this beautiful Valentine's Fabric Roll containing 10 strips, 5" wide, of various pinks, corals, reds. 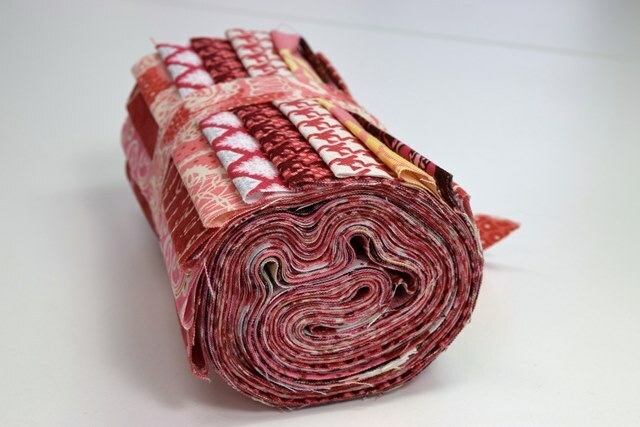 She has a similar roll of 20 strips, 3 1/2" wide in her etsy shop. I just love how it looks all rolled up. Here you can see more of the fabrics. And look what else Heidi included along with her sweet note, a cute wrist lanyard and a pink measuring tape. Now, about February's One Monthly Goal...my goal is to finish at least 9 Outlined Plus blocks by February 17th. 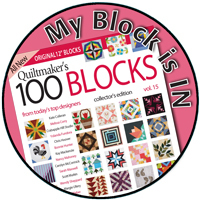 That is the deadline to have your Outlined Plus blocks completed in order to be eligible for the great prizes being offered by Cindy @ Hyacinth Quilt Designs and Cheryl @ Meadow Mist Designs. 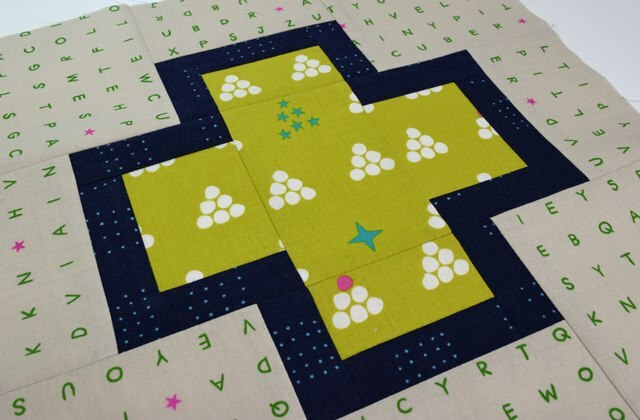 Outlined Plus is the lasted quilt pattern by Cheryl of Meadow Mist Designs. It is not too late for you to purchase a copy of Outlined Plus from her etsy shop and get piecing. 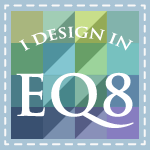 You can read the most current update about the QAL on Cindy's blog. 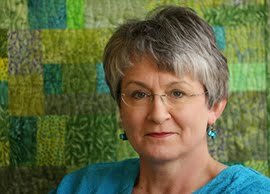 Hop on over to Red Letter Quilts to see what everyone else has planned for February. Thanks to Heidi for hosting One Monthly Goal. 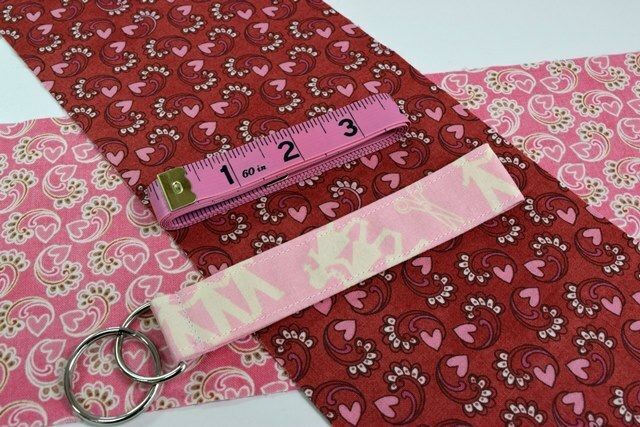 And linking to Sunday Stash #164 and Main Crush Monday since I am crushing on my new Valentine's fabric. I can't wait to see how this comes together! 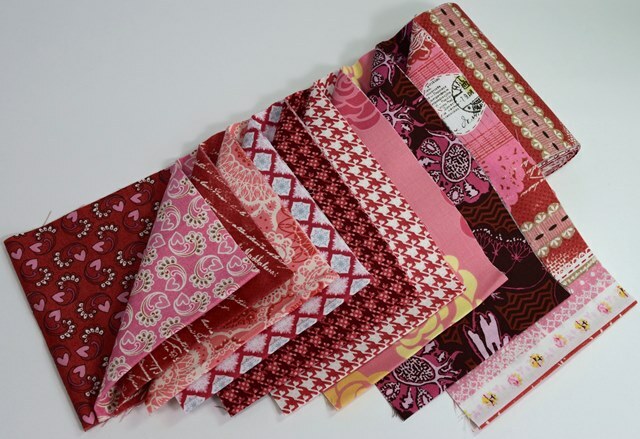 Congrats--those are very pretty fabrics! Love the Outlined Plus block! 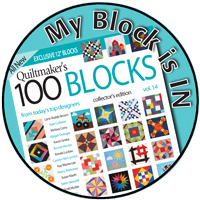 Your block is wonderful and congratulations on your bundle that you received-it is gorgeous! Congratulations on your win. Those are perfect fabrics for the outlined plus quilt. What a fun win Paige! Heidi is a sweetie! 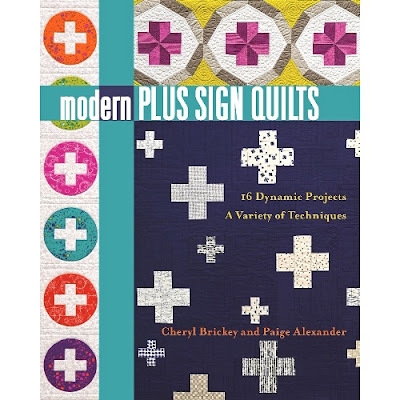 I love Cheryl's Outlined Plus pattern, bought it and am planning to make one too. 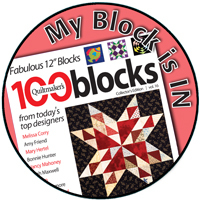 Your block looks fabulous! I love that citron green in the centers, surrounded by black and on a background of LV letters.